Island/Def Jam Senior Vice President gives us another look at the upcoming Nike LeBron 9 P.S. Elite. Island/Def Jam Senior Vice President gives us another look at the upcoming Nike LeBron 9 P.S. Elite. This pair, which is already being slapped with the nickname of "Taxi," sports a predominantly Varsity Maize upper with black filling in the tongue, laces, inner lining and carbon fiber support overlay. Red is used minimally on the heel tab; white fills in the Swoosh logos and midsole; and black works the Max Air bag and outsole to complete the look. 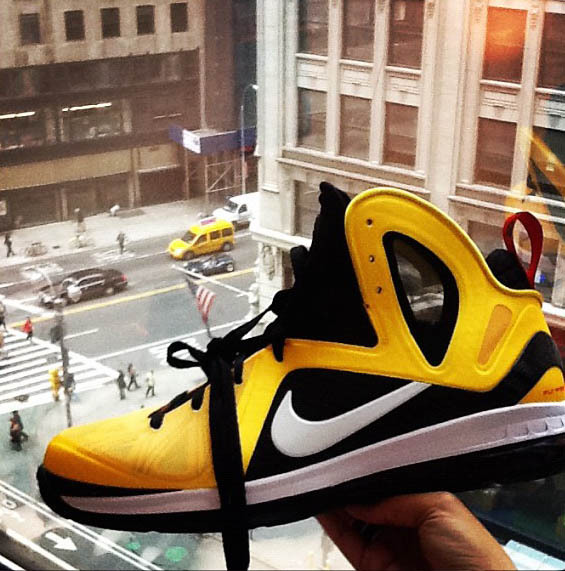 The "Taxi" LeBron 9 P.S. Elite is set to hit stores on Saturday, May 12.